This week’s article was written by CUESA volunteer Janet McGarry. While politicians in Washington argue about the Affordable Care Act and the intricacies of the next Farm Bill, they would be wise to consider the root cause of the deadliest diseases of our time: poor nutrition. In a recent report, the Union of Concerned Scientists (UCS) examines the links between misguided farm policies and skyrocketing health care costs in the US. The report finds that taking subsidies away from processed food ingredients and investing in fruits and vegetables instead could save thousands of lives and billions of dollars. 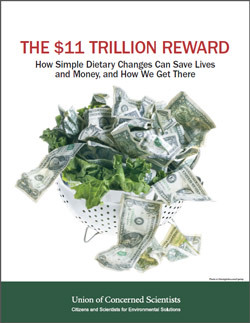 “The $11 Trillion Reward” analyzes the relationship between diet and cardiovascular disease (CVD) and the high costs of treatment. The leading cause of death in the US, CVD is a class of diseases, including heart diseases, stroke, and high blood pressure. In 2010, the health care costs for CVD were $273 billion, accounting for 30% of Medicare expenditures and 12% of Medicaid expenditures. By 2030, the cost is projected to balloon to $818 billion. Dr. Ritterman explains that the underlying cause of heart attacks and stroke is metabolic syndrome, which has been linked to excessive consumption of simple carbohydrates such as sugars, white bread, and starch. “Anything that moves us away from these foods will result in fewer heart attacks and strokes,” he says. Dr. Ritterman recommends eating more fresh vegetables, especially green, leafy vegetables, and healthy amounts of whole, fresh fruits. The UCS report calculates that if Americans ate even one more serving of fruits or vegetables daily, more than 30,000 lives and $5 billion in medical costs would be saved annually. And if Americans followed USDA dietary recommendations for consumption of fruits and vegetables, more than 127,000 lives and $17 billion in medical costs would be saved each year. An apple a day can indeed help keep the doctor—and expensive bills—away. If Americans ate the recommended amounts of fruits and vegetables, the potential value of our increased longevity to our economy would be an astounding $11 trillion, according to UCS. This estimate is conservative, as it does not factor in the improved quality of life from better nutrition and health. O’Hara argues that food policy is forcing Americans to pay twice: first, by subsidizing commodity crops like corn, which are used to make high-fructose corn syrup and other unhealthy processed food products, and second, through health care costs to treat diet-related illnesses. Rather than investing in foods that ultimately make Americans sick, O’Hara proposes that the government should put those financial resources toward growing and promoting produce. 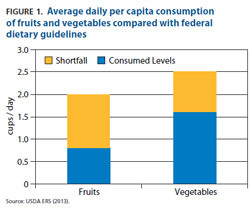 UCS supports policies that encourage increased consumption of fruits and vegetables. Proposed reforms include investing in research for fruit and vegetable crops, changing current regulations that prohibit commodity crop farmers from growing fruits and vegetables, and making federal crop insurance available to more fruit and vegetable growers so they can obtain credit more easily. On the consumer side, the report also advocates for investing more resources in increasing access to healthy food through farmers markets, retail stores, and distribution facilities; programs to educate consumers about nutrition and food preparation; and food assistance programs, like SNAP. “The $11 Trillion Reward” has attracted interest since its release in August at the Mount Sinai Greenmarket, a farmers market at Mount Sinai Medical Center in New York. In September, O’Hara, accompanied by a cardiovascular doctor and farmers market representative, spoke at House and Senate briefings on Capitol Hill. When asked about signs of positive change in the Bay Area, Dr. Ritterman said he was pleased when Kaiser brought farmers markets to hospitals and health centers. He also applauds the work of Lucia Sayre, Co-Executive Director of San Francisco Bay Area Physicians for Social Responsibility, who is improving the sustainability of food services at hospitals throughout California as part of Health Care Without Harm’s national initiative Healthy Food in Health Care. About 25% of the state’s hospitals are currently participating in the program. Images from the Union of Concerned Scientists.